Despite finishing 1.4 seconds off the pace in testing at Valencia, BMW man Troy Corser remains positive in the potential of his S1000RR. In the latest round of weather interrupted testing the double WSB champion finished joint sixth fastest with his team-mate Ruben Xaus after spending 75 laps evaluating and testing new set-ups and components. 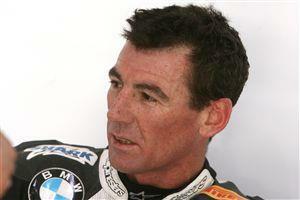 Corser said: “After the weather eventually improved and the track warmed up it was down to the usual programme of going out for five or six laps, then coming back in to the pits and giving info the technicians. Because we had lost so much time to the weather, the team threw quite a lot of stuff at us and maybe there was a bit too much to try in the available time and it was quite easy to get a bit confused sometimes. “The bike has improved quite a bit since the end of last season and it’s natural for the team to want to get as much info as possible, but sometimes that’s a bit hard on us riders because only so much can be done in a limited amount of time. Having said that, I feel we learnt quite a bit and found have some good ideas and directions to take the next time we go out.